Last week we put our collective heads around the thorny issue of gifting. The theme has resonated strongly with many people. And brought up some really interesting stories. It has also raised a lot of questions about friendships for me. Ones that I thought would be interesting to delve into here through the Circle of Friends. I guess like most things, if you start to scratch beneath the surface, it’s amazing what emerges. This week’s theme invites you to share your most unique experience of friendship. What moment, memory, experience, person comes to mind? As I was preparing for this the first thing that popped into my head was black swans. Yes indeed! When I was still working, out and about on community visits, I sometimes went to a quiet park by a flowing creek in the middle of the CBD to eat my lunch. I carried a small ziplock bag of wild bird seed with me for just these occasions. It was a beautiful, sunny day. Having parked the car in a shady spot, I walked down hill to the sheltered park. I’d been there many times before. Sitting at my favourite picnic table under a giant old gum tree, I opened my book and munched on the sandwich I had just bought at the local shop. Wild ducks, willy wagtails, honey eaters and other birds curiously watched, waiting for crumbs to fall. They were used to folk feeding them. I tossed them a few seeds. This of course came to the attention of the ducks paddling in the creek. Waddling up the bank, they warily approached me, dashed in quickly to grab a bite before heading off to safety to gulp it down before some greedy neighbour snapped it out of their beaks. I had a habit of talking to them. Like children, I would scold the greedy ones and tell them to play nicely and share. And of course I would always throw a handful to the shy, retiring ones that seemed to miss out. Except when I was around! I made sure they got their fair share. I had noticed some black swans gracefully sailing in the distance too. Unusual, I thought, for swans to be here. It was not long before the swans got curious as well. They swam to shore and climbed on land. More and more of them appeared. Tranquil and serene, the stillness became something even more extraordinary. Forming a semicircle not five feet in front of me the swans were joined by the ducks and smaller birds. There must have been 30 or more of them. An amphitheatre of black swans and birds were paying me homage as if I were royalty. It was magical. I scarce dared to breathe for fear of disturbing the moment. How long it lasted I couldn’t tell you. Eventually, I slowly retrieved the bag of birdseed. Scattering it on the ground close to me, the birds calmly came and pecked away. Some of the swans, however, came one by one, stood right next to me and fed from the table top. I have never before, or since, experienced such purity of enchantment and delight. A unique moment of friendship and connection I will never forget. when you say they’re just what you wanted. Put them on the table by your bed. If participating please add link to this post and tag – circle of friends. 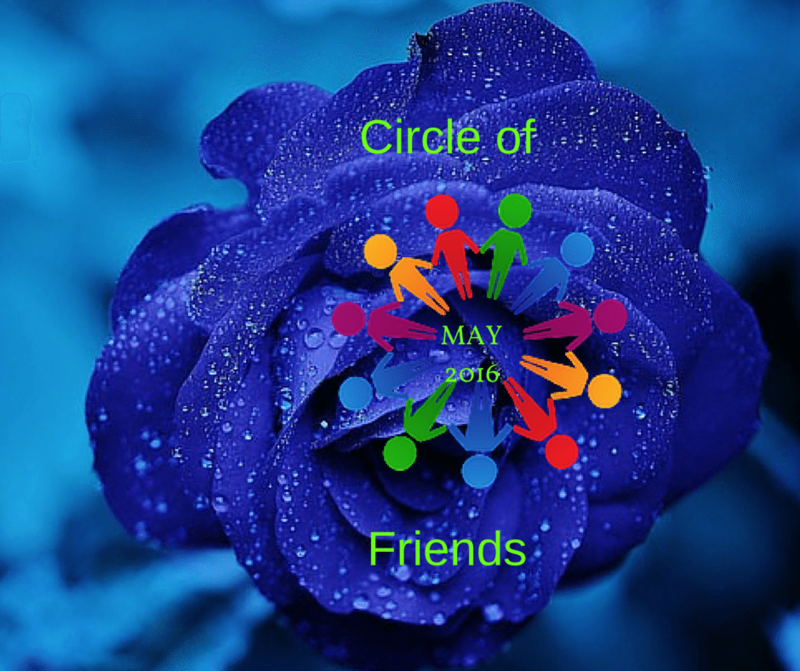 New to THE CIRCLE of FRIENDS month of May here at Soul Gifts – Telling Tales? Not a blogger? Doesn’t matter! You can still take part by emailing me at soulgifts2012@gmail.com , commenting at the end of the post , on LinkedIn or my Facebook page. Take part in as many or as few as you like. The topics I suggest are just that – suggestions. You may have something else in mind entirely. That’s fine too. Or you may want to visit week 1 in week 4. That’s OK too. “Finlandia” is one of my favorite classical pieces. And, of course, “Be Still My Soul” (one of my top five favorite hymns) is based on Sibelius’ music. His music is soul stirring. It gets played on the classical radio station here a lot. Helsinki has erected an exquisite sculpture in his honour. He’s probably one of Finland’s better known famous people.